Join the marvelous Oceania Marina on an incredible 14 night sojourn through the Baltic Sea! The Oceania-Class Marina represents an evolution of the line’s extremely popular Regatta-Class ships. Since the inception of Oceania Cruises, the ships have delivered an unparalleled onboard experience. So many of the indulgences are a direct result of the ships’ ideal mid-size, a tradition that Marina will proudly continue, but in an even more refined incarnation. She personifies the Oceania experience and then some. While larger than her consorts Regatta, Insignia and Nautica, Marina remains comfortably mid-size, adroitly utilizing the additional space for even greater amenities. She rewards guests with the signature “finest cuisine at sea” in six restaurants, including two new gourmet venues — Jacques and Red Ginger. Her new La Reserve holds enlightening wine and food pairings. For special coffees and snacks, there is Baristas Coffee Bar. The new Bon Appétit Culinary Center offers hands-on cooking instruction under the guidance of master chefs. Similarly, artists-in-residence teach fine arts in Artist Loft, a new enrichment center. Intimate lounges abound. Accommodations in every category are incredibly spacious, especially with regard to the lavish bathrooms. Yet remarkably, with so many additions, the onboard ambiance and experience remains comfortably familiar. 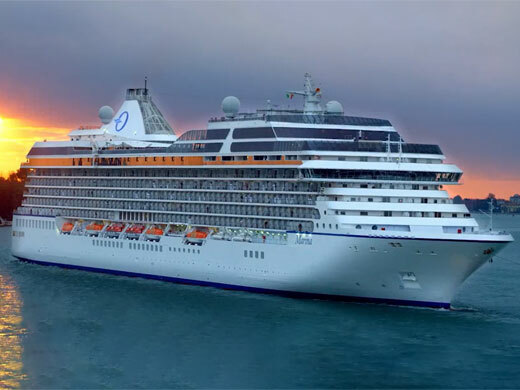 Oceania Cruises have retained everything guests adore about the ships and raised the bar even higher. Located in the heart of Copenhagen's Latin Quarter, SKT. PETRI is a hotel offering a refined sense of laid back luxury. No matter your reason for staying with us, we will strive to make your stay as pleasurable as possible – at the hotel and around Copenhagen.